Which Flag Base is Best for Me? 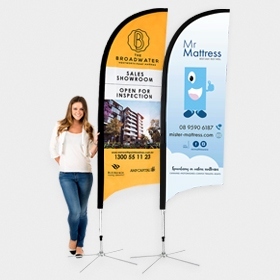 Selecting the correct base for Teardrop Banners, Bow Banners & Rectangle Flags is important to ensure you can use them anywhere you want. All of our bases fit on all of our flag poles, so you can purchase multiple bases to allow you to use your flags at any event or location. 1. Ground Spike: This is our most popular base which allows you to stand the flag up on soft surfaces, such as grass or dirt areas, garden beds & sand at the beach. 2. Folding Cross Base with Water Bag: This base allows you to use your flags on hard surfaces, such as indoors on carpet or outdoors on concrete. We find this model to be very easy to transport as you can simply drain the Water Bag once you have finished displaying the flag and the legs of of the base fold together. The water bag is heavy duty and when filled with water it weighs 11 kgs - so it provides great stability for the flags in most conditions. As the water bag is so heavy when filled it is important that it is not dropped, as the impact could split the bag open. 3. Premium Cross Base: A great base to choose when using your flags outdoors. The flat steel cross pieces are powdercoated black for a great finish and to provide resistance to the elements. This base can be used both on hard surfaces or on dirt - as the cross pieces have 4 x 10mm diameter holes which allow you to secure them to the ground using tent pegs. The base is 825mm wide so provides great stability for your flags and then the 2 cross pieces just fold together for easy transportation. 4. 30 Deg and 0 Deg Wall Brackets. These bases are perfect if you have a set location at the front of your store or on a fence that you will be putting your flags out on each day. These brackets are designed to be permanently screw fixed to a wall or fence and allow you to simply take the flag on and off each day. There are two options available, our 0 degree bracket allows the flag to sit straight up, the 30 degree option allows the flag to point out on an angle. The size of the base plate on the wall brackets is 100mm x 100mm with hole centres 70mm apart. 5. U-Shaped Car Base. This is a very popular option for car yards and real estate agents. This base simply slides under a car tyre and is locked into placed by the tyre so your flag is very stable. 6. Heavy Duty Square Base (10kg). This is an alternative to our 2 Cross Base options. This base weighs 10 kgs and is 515mm x 515mm wide x 10mm thick so will provide great stability for your flags without the need for a water bag. It provides a clean flat base that can minimise tripping hazards so is perfect for use outside shops and in walkways. As it weighs 10 kgs it is not as portable as the Cross Bases. 7. Vertical Floor Bracket. This base is very similar in appearance to the Wall Brackets but the spindle points straight up. This allows you to install it permanently to a solid surface where you would otherwise use one of the Cross Bases or Heavy Duty Square Base. If you need to order some extra bases to use with your existing Easy Signs poles, you can purchase these items separately at Flag Poles & Bases. Remember, our bases are universal across our range of Teardrop Banners, Bow Banners & Rectangle Flags. It doesn’t matter what size you choose, the bases are the same for all. If you have any questions about which flag base would be best for you, please contact our customer support team.